Derech HaKodesh - Hoc est, Via Sancta... sive Biblia Sacra eleganti et maiuscula characterum forma, Torah, Neviim and Ketuvim, arranged by Elias Hutter. Hamburg: Iohannem Saxonem [Johann Saxo], 1587. One of the first Hebrew books printed in Hamburg. Bound in a fine, early parchment binding, featuring a blocked armorial stamp and the initials I.E.M.B. This Hebrew Bible, known as Hutter's Hebrew Bible, was prepared by the Hebraist Elias Hutter, professor of Hebrew at the Leipzig University. Hutter aspired to produce a Bible which would be easy to read, and would facilitate the study of Hebrew. He therefore printed it using two different types – the root letters were printed in regular, thick type, whilst the inflectional letters were printed in hollow type. The root letters which do not appear in the word were completed above it in small type. The editor's foreword in Latin is featured at the beginning of the book, including two tables of Hebrew grammar, with explanations in Latin, and a verse from Psalm 117 in 30 languages. • Cubus alphabeticus sanctae ebraeae linguae – composition on Hebrew grammar, with many tables, by Elias Hutter and David Wolder. Hamburg, 1588. Latin. 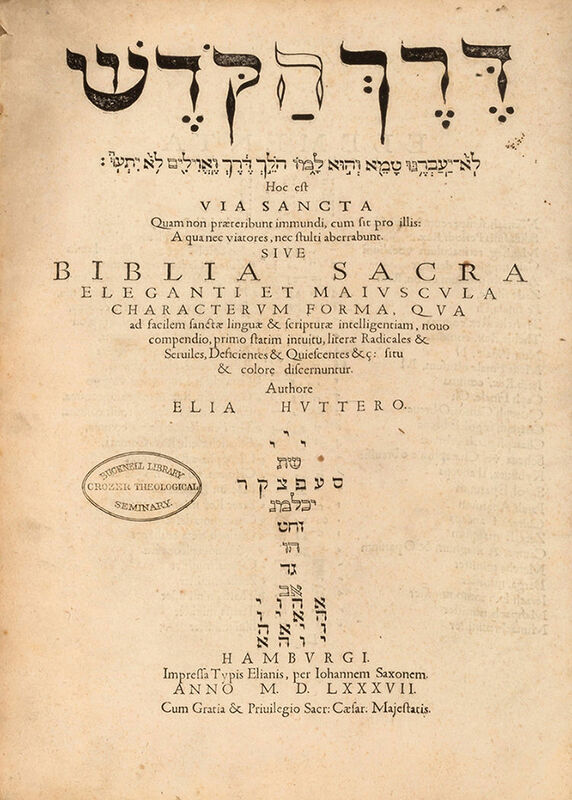 • S. Theologiae Doctoris; Praepositi Berlinensis, In Eliae Hutteri Biblia Ebraea, by Jacob Colerus. Latin. leaves, 1028, 477-480, 1033-1135, , 1141-1572; , ;  pages. Lacking pp. 1029-1032 (2 leaves) from Yechezkel, in their place pp. 477-480 from Shoftim were included a second time. 38.5 cm. Thick, high-quality paper. Good condition. A few stains. Minor marginal damage to several leaves. Stamps and bookplates of the Bucknell Library, Crozer Theological Seminary. Early parchment binding. Minor damage to binding.